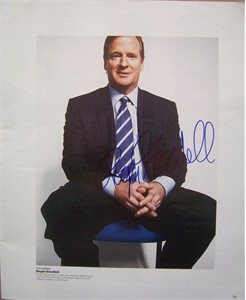 ESPN Magazine full page photo autographed in blue marker by NFL commissioner Roger Goodell. Obtained in person. With certificate of authenticity from AutographsForSale.com. ONLY ONE AVAILABLE FOR SALE.